Daniel Erspramer is CEO of the Pelican Institute for Public Policy, a free-market think tank in Louisiana. Louisiana has joined the growing ranks of states that have embraced comprehensive criminal justice reform. The Pelican State passed a reform package in June 2017 with strong bipartisan support, and will pursue additional reforms over the next year. Focusing prison space on serious and violent offenders. Tailoring habitual offender penalties to the severity of the offense. Ensuring that criminal justice fines and fees do not become a barrier to successful re-entry. Requiring that savings are reinvested into programs and policies that will reduce recidivism and support victims of crimes. These are reforms that conservatives should continue to champion across the country, including here in Louisiana. As is the case of many other states, Louisiana spends extravagantly on criminal justice. In fact, we currently imprison more people per capita than any other place in the world. That comes with a hefty price tag—$700 million per year, to be exact. Yet there is little evidence to suggest that the status quo leads to any meaningful improvement in public safety. But thankfully, change is now coming to Louisiana. The new reforms are estimated to save taxpayers about $262 million in incarceration expenses. Of that, $184 million will be reinvested into programs proven to reduce the incidence of repeat offenses and to support victims of crimes, all the while reducing our prison population by 10 percent over the next 10 years. 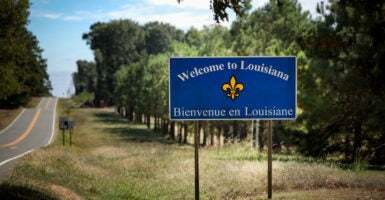 These reforms are the result of years of spadework, led in large part by conservative and free-market leaders and organizations both inside and outside of Louisiana. Conservatives should continue to work together with state leaders to ensure the reforms are implemented well, so we can see the same kind of demonstrable results for public safety that other states have enjoyed, and continue the growing momentum for the national reform movement. In-state supporters of these reforms—which include the Pelican Institute, Right on Crime Louisiana, Smart on Crime Louisiana, the Louisiana Association of Business and Industry, and numerous regional chambers of commerce and economic development organizations—anticipate positive results similar to those in other conservative Southern states. In Texas, prison populations have declined by 16 percent while crime rates have dropped 30 percent. In South Carolina, which began its criminal justice reform initiatives in 2010, both crime rates and imprisonment rates have dropped 16 percent. In Georgia, crime rates have dropped 10 percent since 2012. In North Carolina, crime rates have plummeted by 19 percent since 2011. To be sure, these reforms have generated some opposition, and the temptation for some conservatives might be to write them off, given the enthusiastic level of support they have enjoyed from groups on the political left. The fact is that these reforms will make Louisiana safer by reducing both crime and recidivism, yet in a smart, proven, fiscally responsible manner. These are just the kinds of reforms we should all come together to support. We should welcome anyone from across the political spectrum who joins us in supporting these values. Working together, we can make Louisiana—and our nation—a better place to live, work, and raise our families.